Ancient Rome was not only known for its beautiful streets and its large arenas but also its Gladiators warriors. The Gladiators fought with skill, strength, wit and agility inside the vast battling arena. It was either you get killed or applauded by the wild crowds. The winners earned the nation’s adoration, wealth and the most beautiful of women. The losers were rewarded with death! The Gladiators are back. Not in the box office but your favourite online casino. The slot however features various excerpts from the movie, but the slot has its unique features and characters. Playtech has never compromised when it comes to gaming graphics. 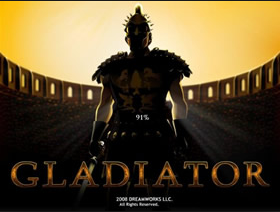 Gladiator slot too is designed with high-quality graphics. The symbols are sharp and well crafted. You will be treated to Gladiator related characters such Senator Gracchus, General Maximus, Lucilla, Emperor Marcus Aurelius, and the King of the great kingdom. The game also features the conventional card deck symbols; Ten, Nine, Jack, King and Queen. Bagging three or more of these symbols will likely give you a handsome reward. What better wild than the Gladiator Helmet! The Helmet floats around the 2nd, 3rd and 4th reels. The Gladiator symbol can replace any other symbol (expect the Coliseum symbol) in the game to form a winning combination. When you bag three Gladiator symbols at the same time, you are rewarded with the Gladiator Bonus Round. In the Bonus round, you are ushered to an extra window with nine masks containing different multipliers. You will be rewarded with the total value of the nine masks combined. The Scatter symbol in Gladiator is…. Wait for it… The iconic Roman Coliseum! The Coliseum symbol can land anywhere on the reels. If you get more than two of the Coliseum symbols, you are awarded anything between 2-100x multipliers. Bagging three of more Coliseum symbols unlocks the Coliseum Bonus Round. In this round, you are presented with a stone matrix of 4x5. You are required to choose a stone from each row. The first-row award free spins while the second row awards multipliers. The third row and fourth rows have a scatter and a wild symbol respectively and can be used during the free spins. This bonus round is best described as a “bonus upon bonus round.” You will want to land this bonus round time and time again. The Gladiator could not be complete without a game of death! There’s a gamble feature that lets you double or quadruple your winnings. In the gamble feature, you will be presented with a face down card. You will need to guess either the colour of the card or the symbol of the card for double or quadruple wins respectively. Make a wrong guess, and all your winnings are gone! Gladiator is one slot that can guarantee you huge wins and fun while at it. During the time of writing, there were two versions of the Gladiator slot; one with a progressive jackpot and the other one without. Both of the versions have a fixed jackpot though.